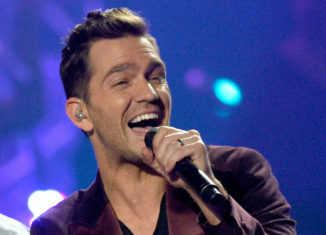 Best known for his hit singles “Keep Your Head Up,” “Honey, I’m Good,” and recent single “Fresh Eyes,” thirty three year old singer-songwriter Andy Grammer was presented by local radio stations WALK 97.5 and K 98.3 for a show at the Paramount in Huntington. The singer-songwriter chose two acts, Oak & Ash and Sir Cadian Rhythm, to open the show. Both musical groups warmed up the crowd and got them excited for what was to come. Once it was Grammer’s turn to hit the stage, fans were surprised that he chose to open the show with what could be his most well known song. The crowd cheered as they recognized the familiar opening notes of Andy’s 2011 single “Keep Your Head Up.” Grammer also surprised the crowd by playing many songs from his first self-titled album. Fans reminisced over throwback songs such as “Fine By Me,” “The Pocket,” and “Miss Me.” Between songs, Andy stopped to talk to the riled up crowd about his love for Long Island and all of the time he has spent in the area. He made sure to mention his love for New York pizza and the fact that he stopped at the pizzeria across the street from the venue, Little Vincent’s, before the show. Andy also made his performance more interesting by covering some currently well known radio hits. He incorporated Drake’s “One Dance” into a song, “Blame It On the Stars,” from his second studio album, Magazines or Novels. Of course, Andy found a way to put his own twist on the song by playing the trumpet. Later on in the evening, he covered current radio hit “Don’t Let Me Down,” by the Chainsmokers and Daya. Towards the middle of his performance, Grammer took a risk by playing a song that is yet to be released. The song, titled “Good Parts,” is said to be part of the singer’s upcoming third studio album. It was written after his mother died; he explained to the crowd that this song, his favorite song from the new record so far, is about getting to know someone on a personal level rather than just having a bland conversation. Fans quickly caught on and sang along to the meaningful lyrics. Grammer then went on to play a song more familiar to fans. His most recent single, “Fresh Eyes,” excited the crowd as it was the first time that most of them heard the new song live. The rest of the concert was a victory lap for Andy as he sang hit after hit. The whole room was ecstatic when Grammer busted out his 3× Platinum hit that made it to #9 on the Billboard Hot 100 chart: “Honey, I’m Good.” The roof was blown off of The Paramount as everyone screamed at the top of their lungs to the song that has dominated on the radio. That was a great ending to a very high energy concert… or so we thought. Soon after he went off the stage, Grammer and his band returned for an encore. After that amazing concert, the encore song, Good To Be Alive (Hallelujah), was very fitting. This song is about the great year Grammer had in 2016. It is inspiring to hear Andy discuss his roots as a street performer in Los Angeles, considering how far he has come. He even sings a song about it, called Biggest Man in Los Angeles, which he used to end a very successful night. Grammer truly deserves all the success that he has had and will surely continue to have. Given that his new unreleased song that he performed Good Parts was phenomenal, 2017 will definitely be another year to remember for Andy Grammer!